Elevations soaring from 2,700 to 4,300 feet, the views stretch forever down spectacularly-manicured fairways that unfold in every direction. 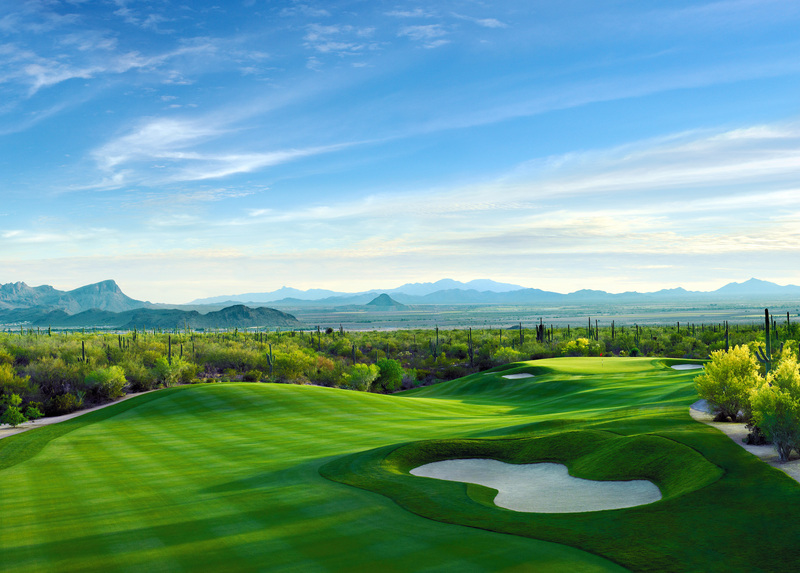 Much of Dove Mountain is protected as open space in this incredible community, so the views and course are always pristine. Arizona State Trust land and formal preserves border Dove Mountain and protect unobstructed mountain and desert views. The homes in the Canyon Pass part of Dove Mountain are in the price range of 1 to 3 million dollars with with square footage from 3,500 to 7,500. The average lot size is about 1 1/2 acres. The homes in Dos Lagos in Dove Mountain are between $700,000 to $900,000 and are on a minimum of 1/2 acre lots. The Gallery Golf Club has two world-class courses that have both hosted PGA Tour Events. The North Course has the most elevation changes as it heads up 2 different valleys with spectacular views of the Mountains and lush desert landscape. The South Course has more subtle elevation changes and some changes in foliage as well. 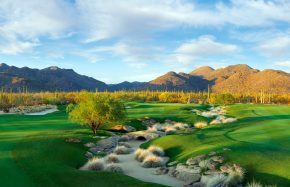 Both courses contain an abundance of giant saguaro cacti that are native only to the Sonoran Desert of southern Arizona and northern Mexico. These exceptional desert courses are enjoyable for golfers of all skill levels. The Gallery at Dove Mountain South Course hosted the WGC Accenture Match Play Championship in 2007 and 2008. There are very few privately owned clubs in the world that hosts two different golf courses of of the same quality as those on the PGA Tour. The South Course was nominated one of Golfweek’s and Golf Digest’s 100 Best. John Fought designed the Gallery South Course to differ from The North Course in style to give a totally different feel so members have variety in their golf. This course is a links style similar to that of Donald Ross’ Pinehurst #2 except that it is set in a high desert environment. The Gallery North Course was designed by John Fought and Tom Lehman. Awesome mountain and desert views up and down two rugged canyons in the Tortolita Mountains await the members of the Gallery at Dove Mountain. The high Sonoran desert foliage is much more lush than visitors would expect if they have visited the Mojave desert of southern California. The North Course provides wide fairways and an abundance of fairway and greenside bunkers that allow golfers of all skill levels a challenging and enjoyable golfing experience. The four major areas of The Gallery at Dove Mountain all provide luxury homes in a peaceful setting with wonderful scenic views. Canyon Pass is a beautiful canyon with the front nine of the North Course looping up and then down the canyon. The spectacular custom homes are set well back from the course on ¾ acre to up to 4 acres. 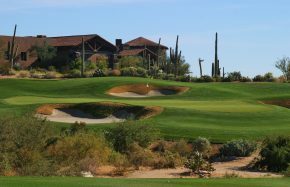 These homesites that started selling in 1999, either have views of the golf course or the saguaro studded mountains or both. The low density of custom luxury homes, ensures a lifetime of peace and serenity in an unsurpassed high desert setting. The canyon winds back well beyond the golf course for secluded, pristine, Sonoran Desert mountain views with an abundance of wildlife including: deer, javalina, bobcats, coyotes and rabbits as well as a wealth of birds. There are several varieties of hawks, humming birds and quail to go along with colorful finches and an occasional cardinal and of course an abundance of roadrunners.